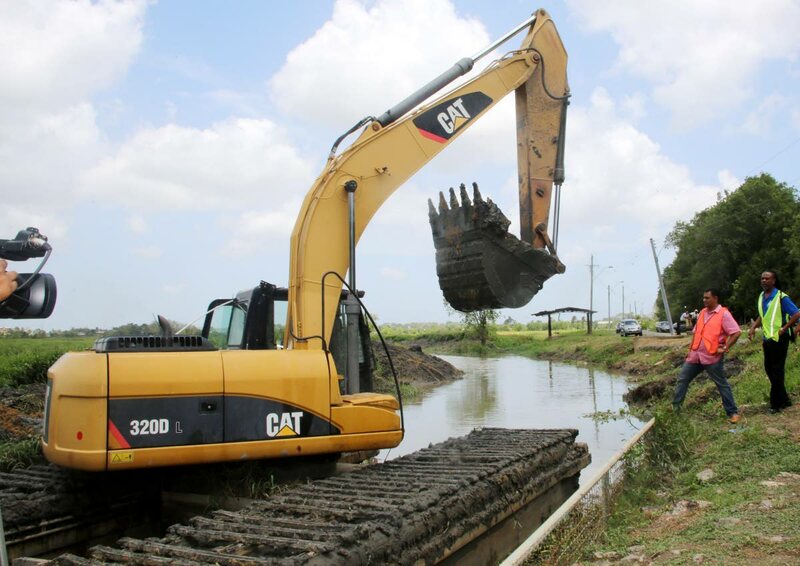 Even as Finance Minister Colm Imbert played his cards close to his chest regarding Thursday’s mid-tear review, Works and Transport Minister Rohan Sinanan is optimistic his ministry would receive additional funding to continue its’ water course desilting programme. Sinanan, speaking to reporters during a tour of desilting works at the Black Water Channel, Gopie Trace, Penal yesterday, said additional funding had been requested as the rainy season was less than one month away. “We did (ask) and I feel confident that we will get additional money for the desilting programme so that is why I am comfortable that we will achieve the 298 projects. I feel comfortable that the Minister of Finance have made a case for desilting,” Sinanan said. “There will always be a challenge for funding and you will never be able to get all the funding that you need but what we try to do at the ministry is get value for money and whatever funding we get we will ensure we spend it in the right areas and the citizens at least get value for money,” he said. Sinanan said 298 projects had been identified throughout Trinidad at a cost of $35 million. He also stated Cabinet had approved a three-year “pump and gate programme” which would assist in alleviating flooding in the rainy season. “About two months ago at the ministry we got the approval for a new pump and gate program for over a three year period where we will be refurbishing all the pumps in Trinidad, replacing what has to be replaced and repair on all the gates,” he said. “These pumps and gates, some of them are about 30 years old, 35 years old and a significant portion is not working. Some gates have not had any work done for 15 years so we will start with the most critical ones, there are about 15 or 20 pumps to be repaired and about 80 per cent of the gates have to be replaced or repaired,” he said. Meanwhile, Sinanan said he was not aware the MV Galleons Passage had once again been delayed as was being suggested by an online news report. “I don’t know of a report that the Galleons Passage has been delayed. The Galleons Passage is coming from a very far distance and when you bringing in a vessel like that you would calculate the expected arrival. There are delays in weather conditions, there can be delays at the port so to give an exact date a vessel would reach is almost impossible because you don’t know what you will meet when you go out into the ocean, if you come across a storm, you will have to slow the vessel all the down,” he said. He said the TT was not in a state of crisis as no one had been left stranded on either island saying the T&T Spirit was performing “quite satisfactorily” on the route. “The T&T Spirit is actually travelling with a lot of excess capacity right now, on most days it will probably operate at 50 per cent so it is not that we are in a crisis,’ he said. However he noted he would be disappointed if the Galleons Passage did not arrive in time for the start of the July/August holiday season. “I will be very disappointed I and don’t see no reason why the vessel should not be here shortly,” he said. Reply to "Sinanan hopes for more from Imbert"